Drum roll, please! I’m pumped up, jazzed, and all around giddy to be splashing the cover of my upcoming romantic suspense novel, MYTH AND MAGIC, on my blog today. I was more than a little worried over how this cover would look when it landed in my lap. Well, if you’ve read my recent releases, you know my writing is slanting heavily toward mystery and romantic suspense. I wanted the cover of my new release to capture the mood of the story which is set at a brooding home with an infamous past. The property has since been converted to a lodge that caters to corporate clients. Into this environment, strange and ghostly occurrences begin to take place putting a damper on business (would you stay at a place where a notorious murder took place?). I asked for a cover without models, just setting. With all of that in mind, take a look at the beautiful, spooky cover Kensington Publishing/Lyrical Press designed for me and let me know what you think! Now do you see why I’m giddy? I love it! It’s everything I’d hoped for, perfectly capturing the tone of the novel. And for those of you who like romance with your mystery and suspense, never fear, there is plenty of that too! MYTH AND MAGIC is scheduled to release on June 9, 2015. In the meantime, you can preorder it on Amazon and add it to your Goodreads TBR List. 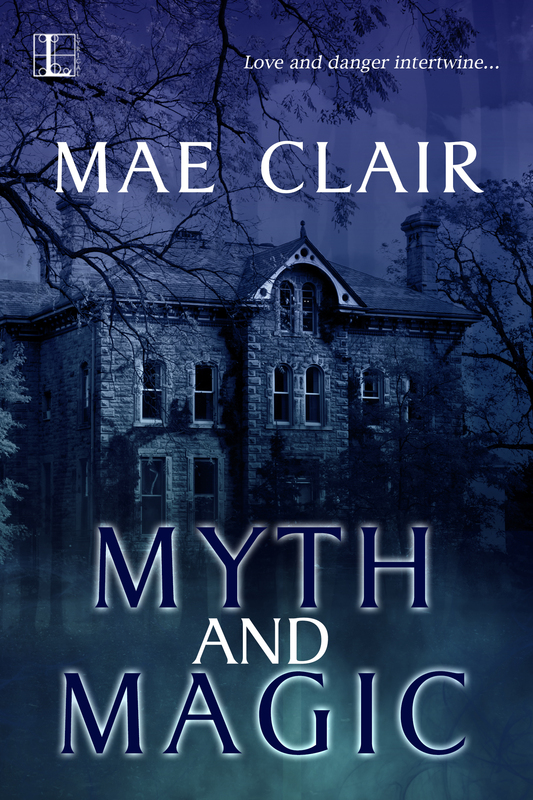 This entry was posted in Book Covers, Book Release, Cover Reveal, Mystery, Romantic Suspense and tagged Ghosts, Halloween, Mae Clair, Mystery, Myth and Magic, Romantic Suspense by Mae Clair. Bookmark the permalink. Mae that cover is wonderful! The shadows and the way they play against the house – they seem to move almost… I think this is definitely one of the best (non-naked abs) covers I have ever seen. Oooh! I love it Mae! Its definitely got that spooky, ominous feel to it! I can’t wait to get a hold of it. Congratulations! Thanks so much, Loni. We love all of our babies, but I’m especially proud of this story. I’m delighted to hear you’re looking forward to it! I’m drooling already. Fabulous cover for, I’m absolutely certain, as fabulous story. HI, Carmen! Many thanks for your congrats and excitement. I’m so thrilled to be able to share this cover with all of my friends! I love it Mae! And I can’t wait to read. Hi, Tammy! Thanks so much. There are a lot of themes that come together in this story which is why I’m so excited about it. I’m thrilled to hear you’re looking forward to reading it! That’s a great cover. It would make me check the first pages and blurb, and that’s its job. Exactly! I am such a visual person, a cover has to pull me in. Once it does that, I’m off to check out the blurb and take a peek inside. Thanks for checking it out! Hey, girl! It IS me, isn’t it, LOL? It makes me think of Market Street and that spooky house two doors down 🙂 Thanks for popping on to share my excitement. I love the cover. They did a great job. Very excited for you. Hi, Mary! They did do a great job, really amazing. But MYTH AND MAGIC also got where it is thanks to my awesome crit partners–you and Laura. Thanks for all your help with this one! That is a stunning cover! And I love stories set around Halloween. Can’t wait to read this one. Fantastic, Gemma! I’ve always loved stories with a Halloween theme too, and was determined to write one. I’m really pleased with the way MYTH AND MAGIC turned out and hope you will enjoy it. Thanks for sharing in my cover reveal! LOVE the cover, Mae. And the blurb totally hooked me. I preordered and marked it on GR! You rock, girlfriend! Thank you so much, and thanks for sharing in my cover reveal. I’m besotted with this one, LOL! OH MY HEAVEN! The book cover is just AMAZING and I love the blurb! Can’t wait to get my hands on this one! AND…you’ll have to visit my blog and tell my readers all about it very soon! YAY!! So glad to hear that! I really do love the atmospheric tones of the cover. Although the story is contemporary, not Gothic, I think the cover has that kind of feel to it. Thanks for popping in to check out MYTH AND MAGIC! Mae, the new book sounds exciting! I got goose flesh reading the blurb. I’ve pre-ordered and added Myth and Magic to my Goodreads TBR list. Good Luck and Congratulations! Ooh, yes indeed I love this cover. The blue at the top is such a deep rich shade, denoting mystery and spooky happenings, and then lightens at the bottom, like– gotcha! Very well done and I can’t wait until it comes out. How wonderful for it to have a Halloween tie in. Don’t forget to come to my blog and do something with this one! Gorgeous cover. I can imagine how anxious writers would get waiting to see the cover their publisher picked. It’s moody and mysterious and definitely made me think of ghostly goings-on. Thanks, Emma. I’ve yet to be disappointed in any of the covers my publishers have done, but waiting for “the moment” when it shows up in my inbox is always kind of nerve wracking. Although I get to submit a Cover Art Form with suggestions of what I’d like to see on the cover, I never know if those visions are doable. In this case, Kensington rocked it! Congratulations, Mae. I am looking forward to this with relish. Love the cover, it certainly gave me the creeps because it looks so like it would be full of wandering spirits. Good luck with it. Thanks, Daisy. I hope readers are surprised by the type of ghosts and spirits that haunt this book, My hero is most definitely a tortured soul. I’m delighted to hear you’re looking forward to the read! I love the cover, Mae! I’m a fan of no characters on my books anyway, so this feels perfect to me. 🙂 I love the premise and need to go preorder very soon! Congrats!!! We already set up an UnCover Monday date for it, right? Hi, Calisa. Thanks for checking out my latest. Yep, I already sent you the stuff for an UnCover Monday in June (love that blog feature of yours)! And I’m with you…I’m finding I prefer books without models on the cover, just setting. Especially when it comes to romantic suspense and mystery. Thanks for sharing in my cover reveal!